Welcome to this continuing medical education activity titled, “Poly-L-Lactic Acid Basic Injection Techniques.” The following activity is sponsored by Omnia Education and supported by an independent educational grant from Galderma Laboratories. Hello, my name is Dr. Sabrina Fabi, and today we have a beautiful 47-year-old patient who is extremely active in her life, and she has noted a little bit of volume loss and a little bit of laxity. Today, we are going to be showcasing the use of PLLA to pan-facially volumize our patient. 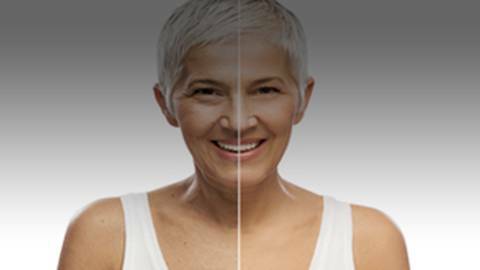 We have to recognize that aging of the face as well as the body is a very dynamic process. It is occurring at multiple tissue layers, not just at one, and so we recognize that we are having some level of bony resorption with age, and studies comparing men to women have shown that women substantially lose a lot more cortical bone of their skull with age, and this is secondary to some of the depletion in estrogen that we see, especially once we go into menopause, as well as a decrease in parathyroid hormones that occur with age. In addition, calcitonin as well as vitamin D contribute to bony remodeling, and so these are certain factors that may also accelerate bone loss and bone remodeling with age. Studies looking at the different fat compartments of the aging face have also demonstrated a loss of the extension of the buccal fat with age, and with that perhaps a descent of the middle cheek fat pad as well as the deep medial and lateral cheek fat pads with age losing some level of support because of a lack of this fat pad. In addition, we start to see some resorption of the maxilla secondary to bony changes, and this also contributes to the lack of support that we see in the mid-face and accentuates the nasolabial fold that patients commonly come in complaining of. So as we know we are losing a little bit of bone with age, our patient actually has pretty good bony formation and she has retained that bony remodeling, but what we see in studies that compare men to women is that women do lose substantially more cortical bone of the skull with age, and this is partly related to a decrease in estrogen that we see with age, especially once we go into menopause. So anytime I look at patients, I always kind of try to determine if they have good structure or bone to support their soft tissue or if they have great structure or bone like our patient but they just don’t have the deep fat or superficial fat to coat that bone, and so in the case of our patient, if we assess her bone and we start off there, we recognize that she has got great zygoma, she has got a nice mandible that extends back very well, and so she has got great structure to support her soft tissue, although we see with age not only resorption of the skull but also some maxillary resorption and inward rotation. This maxillary inward rotation does not give structural support to the deep medial cheek fat pad and then the overlying superficial fat pad, and so what we see is a descent and a cause of a nasolabial fold, which is what generally brings our patients in complaining, and so in our patient, not only do we see a little bit of that rotation, but actually she has lost her deep fat pad compartment. Because she is so active in her case, although she has got great bone, she has actually lost a lot of deep fat as well as a little bit of superficial fat. Today, with the use of PLLA, we are going to be basically pan-facial volumizing our patient. Now, we have to recognize with PLLA that you may have to do a couple of treatments over four to six week intervals, and so in a patient like this, the reason I may select PLLA over a more viscous hyaluronic acid filler is that it may take many syringes of that viscous hyaluronic acid filler to be able to accomplish a pan-facial volumization, and so as long as the patient has the realistic expectation that it may take a series of these treatments, we can get her to that desired effect. So, this is the ideal patient in my practice that I would elect to use PLLA because it will take up to 2-3 cc of product to inject just to restore volume in her temple, and sometimes patients do not want to pay for 2-3 cc of a hyaluronic acid product to just inject into their temple, and although they may pay it to inject into their cheek, we ultimately are not restoring all of the fat compartments that are being depleted with age and therefore not offering our patient a comprehensive result and a truly three-dimensional result if we just focus on certain fat compartments. So with the use of PLLA, I can basically address all of those fat compartments and give my patient a more natural and three-dimensional rejuvenative effect. So when injecting PLLA, I like to reconstitute my product with 7 cc of bacteriostatic water overnight for at least 24 hours. I do this to avoid the incidence of papules and nodules, which have been seen when product is not reconstituted overnight. The FDA label states for only a two hour reconstitution, but we prefer to do it overnight as well as when you don’t reconstitute with dilutions greater than 5 cc, which is presently the FDA required amount. So with 7 cc of bacteriostatic water, I reconstitute my product overnight, and then at the bedside I add 1 cc of lidocaine without epinephrine. In our patient I am going to be using two vials, so a total of 16 cc at this reconstitution in order to achieve pan-facial volumization. Then I am going to have her come back in four to six weeks in order to do a second treatment, and in our patient, she will probably need about a series of four spread out four to six week intervals. After we have achieved the desired effect, I generally have my patients come back anywhere between six to eight months later after their last injection in order to maintain their results and not have to do the series of treatments again. I like to inject my PLLA with a 1 cc Luer-Lok syringe as opposed to the 3 cc Luer-Lok syringe that other doctors choose. I feel like I have more control when I use a 1 cc Luer-Lok in the deposition of my product and being able to stay honest with where I inject it, but both have been used very successfully with great results. When I inject, I always use a 25-gauge needle. You can also use a 25-gauge 1.5-inch cannula for areas where there is vasculature that you want to avoid. Our patient has had topical anesthetic cream. I personally use 23% lidocaine 7% tetracaine, but you can use any of the ones that are available as well, and I had her use it for one hour prior to injection, although in my experience 30 minutes suffices. Sometimes patients do not have time for the use of topical anesthetic cream. In which case, I do numbing dots with 1% lidocaine with epinephrine. In my experience, I have seen when I use this just at the introduction site, I constrict those local vessels and possibly may add to a decrease in bruising from my injection point. As with any injection both on the face and off the face, it is important to always practice a good cleansing technique. So I am going to be bringing back our patient to inject her with some numbing dots of 1% lidocaine with epinephrine first before I proceed with injection. Prior to injection, I always have my medical assistants vortex or shake the PLLA in a Vortex Genie that exists that allows the PLLA to re-suspend evenly throughout the solution. Otherwise, I have my medical assistant at the bedside moving the product, inverting the syringe up and down to ensure that the PLLA is evenly distributed and does not clog my needle. So I just injected a total of 2 cc into the super periosteal space between the temporalis muscle and the periosteum of the skull. I ensured to withdraw back once I hit that space in order to not get any blood in my syringe and ensure that I was not in a vessel, as in that space posterior to the temporalis muscle lies the posterior deep temporalis artery. When injecting the temple, I do inject boluses of between 0.5 to 1 cc of PLLA per injection point because I am under the temporalis muscle and the fossa is extremely large, and it doesn’t just encompass the area that we see but extends all the way back, and so that product will spread. I ensure that I am under the temporalis muscle, which I feel because of the resistance I feel as I go through it and the patient feels because they hear a crack as I go through that muscle. This product is not intended to actually be injected into the superficial fat compartment which is what we are actually seeing volume loss into, which is the lateral-temporal cheek fat pad. Now I am going to be injecting in the subcutaneous plane, as in this area we have epidermis, dermis, very thin subcutaneous fat, and then immediately below that, we have the SMAS. Then we have the facial compartment that enwraps the parotid, and then we have the masseter muscle depending on exactly what area you are in. So, we want to ensure that we are above the parotid as to not inject into the parotid and create a sialocele potentially. Now, super-periosteally, I am delivering about 0.5 cc of product on each side. This is an area that is extremely dynamic. You have to be careful to not inject into the DLI, DAO, orbicularis oris muscle, as this product likes to accumulate in areas where there is a lot of motion and movement. For people beginning, you can use a 25-gauge 1.5-inch cannula to deliver your product into the deep medial cheek fat pad, both the medial compartment as well as the lateral part of that compartment, to avoid injection into any vessel and also to deliver into Ristow’s space. Important things to take away when injecting this product: You don’t want to inject it into areas that move, or mimetic muscles essentially, because the PLLA will essentially accumulate in those areas of a lot of movement, especially around the mouth, and so you have to be very careful and use very little amount of product if you are going to be injecting along this pre-jowl sulcus. When injecting into the cheek, it is important that you are deep to those mimetic muscles so again that you are not injecting into zygomaticus major or minor muscles, and injecting super-periosteally if you are going to be injecting over the zygomaticus and injecting under the zygomaticus muscle and under SMAS when injecting into that deep fat pad. It is important to remember to not inject into the parotid when injecting into this preauricular area or what is called the temporal-lateral cheek fat compartment, so you are injecting subcutaneously when you are in this space as well as when you are extending that mandibular angle and injecting along the area between the earlobe and the mandibular angle. It is important to remember this product is not intended to be used intradermally or injected intradermally, either, as the particle size is between 40 to 63 microns and so the product is not meant to be injected very superficially. You can use other hyaluronic acid products that are thinner and intended for that use if that is the case. Areas that I do not inject PLLA include to restore volume in the tear trough. Classically, with just improving that deep medial cheek fat, you don’t really need to add much to the tear trough, so it is not intended to be injected for tear trough deformation. I also do not use this product into the lip, again because most of the product that we do usually inject submucosally into the lip is into the obicularis oris muscle, and it is an area that does use a lot of movement. It is also not advised to inject this into the forehead even if you are in that super-periosteal space or the subgaleal compartment because even though it is in a vascular plane, the frontalis muscle is pretty much over it, and a lot of movement from the frontalis has been shown to cause nodule formation or papule formation when injected in this area. And that concludes the session. You’re listening to the continuing medical education activity titled, "Poly-L-Lactic Acid Basic Injections Techniques." Presenting the next case is Dr. Becky Fitzgerald. Hi, I’m Dr. Becky Fitzgerald, We’re here today with Jackie, who is 39-years-old, to do treatment with poly-L-lactic acid. You know, as we age, all structural tissues age, right? The craniofacial skeletal support changes in both size and shape. All the soft tissue that sort of upholsters that craniofacial skeleton slips on that changing base, and then it changes in its own right, too, and then the skin that wraps around the whole thing very tightly like a Spiderman mask when we’re 18 isn’t quite so tight anymore. So, how do you know which one to fix? Well, most of us lose a little bit of integrity in all of those structural tissues, and one way to look at that is to use the asymmetry on every face. As an embryo, the two sides develop. The neural tube kind of goes right down the middle of the embryo, and the two sides develop like siblings, not twins. So we all have sort of a shorter, fatter side and a longer, skinnier side, and we can compare those to sort of look at the changes in all of the structural tissues of the face. So these, like I said, are not isolated entities but downstream markers of a global process, and one of the nice things about PLLA is it allows you to address that global process. Of the superficial compartments, there’s kind of a nasolabial compartment, and then there’s a medial compartment, a middle compartment, and then this very large temporal and lateral fat compartment, and this temporal and lateral fat compartment is what’s missing most on Jackie’s face. So what we’re going to do is sort of do a global treatment with PLLA today. I’m going to start with the upper face and move inferiorly. So, we’ll start with the temporal and the lateral fat compartment. Then we’ll do in the center of the face where I’m mostly replacing this deep fat. Then we’ll go around the canine fossa and the bone and a little bit deep to the mentalis muscle and also along the mandible. the PLLA is supplied in a glass vial as a dried lyophilized product in the bottom of the vial. So this product, unlike HA, is not received sort of ready to use. It’s reconstituted prior to use. So, it’s reconstituted with sterile water, usually preserved sterile water, and the amount that you use is somewhere between 7 and 9 cc for the face. All face usage is somewhere between 12 and 16 cc. I remember Dr. Vleggaar, Danny Vleggaar, who taught the entire world how to use Sculptra, telling someone once who said, “…but so-and-so uses 7 cc, and so-and-so uses 9 cc.” He sort of shut down the conversation by saying, “You know, I once met a doctor who used 7.256 cc dilution.” The point is, between 7 and 9 is fine, and a little bit of lidocaine kind of takes the edge off. I don’t use lidocaine with epi because I think it burns more, but some practitioners prefer using lidocaine with epi because they think that it probably bleeds less, and that’s really just a style issue. Any of it is fine. This really, really, really dry product takes a while to hydrate. So when you put the product in, you don’t put the product in and shake the vial because it takes about 24 hours or a few hours anyway for this product to really soften up. So if you splash dry product up on the side of the bottle and then it sits with the water overnight, the particles that are stuck on the inside of the vial will not hydrate, and then when you mix it before use the next day, you’ll mix them in with the hydrated product, and that product which is not hydrated may hydrate in vivo and be one of the causes of lumps and bumps. So, it’s better not to splash the water when you put it into the vial and to just sort of run it down the side of the vial very carefully and then set it back in the box. If I mix this product vigorously, then I’m going to get some foam, and that foam is what clogs the needles the most. That product precipitates out pretty quickly, almost the way that Kenalog does. So if it’s been sitting on the tray for a while, most of the product is at the bottom of the syringe. If I do this to mix it, it mixes a little bit, but it doesn’t mix really, really well. If I instead put about a cc of air in here and I turn this 180 degrees, and I do that three or four times, I can really mix that as a milky white suspension of powder in water. So, we’re going to start on the side of her face, and see if we can get this temple to kind of match the other side. I’m just using an ice roller so that it’s a little bit more comfortable for her. Again, I reflux prior to every injection. Because of the low viscosity, because it’s water, I should be able to reflux if I’m in a vessel. If, however, when you try and reflux, the plunger won’t move at all, it may be because the bevel of the needle is sort of vacuumed up against a vessel wall, and that’s not really a negative reflux. The plunger has to move for it to be a negative reflux. She’s a little bit numb on this side now, and what we’re going to do is some massage for her face just to make sure that everything is where we want it and that we’ve gotten everything smooth and all the water is smooth, and then we’ll teach her how to do that massage at home. A lot of people use the rule of five so that you massage five times a day for five minutes a time for five days. What I think we’re really doing with this massage is not placing the particles into place. I think that we’ve done that when we put them in and massage immediately after. We’re just trying to keep the circulation up. You know, we know that over the first week, we’ll initially get a reaction with polys, and then that’ll be replaced by monos and then foreign body giant cells, and then we’ve got some fibroplasia, and that fibroplasia provides the collagen and the volume from this biostimulating product. So, you just want to keep that circulation really up while that process is going on. So, for the first week, doing a little bit of massage can possibly help, but it’s important, I think, to tell the patients that they can’t massage wrong. They can’t do anything wrong. If they just use the heel of their hand and rub their cheek a little bit or rub their temple a little bit or massage like this, that’s good enough, and a few times a day for a few days, even if it’s a minute or so, I think is better than nothing, and that probably encourages compliance. So, thank you very much for your time. You’ve been listening to "Poly-L-Lactic Acid Basic Injections Techniques" on ReachMD. To view the video for this activity, visit ReachMD.com/Omnia. Thank you for participating. With the appropriate use of PLLA, you can give your patients a more natural and three-dimensional, rejuvenated look. Here’s how. Using Poly-L Lactic Acid (PLLA/Sculptra®Aesthetic) gives you the ability to enhance your patients’ facial volume—but only when done correctly. Here to review the best practices for using PLLA on the most common areas of the face are Dr. Sabrina Fabi and Dr. Rebecca Fitzgerald. Sabrina Fabi, MD, FAAD, FAACS has disclosed the following relevant financial relationships: Served as an advisor or consultant for: Valeant, Galderma, Allergan, MerzServed as a speaker or a member of a speakers bureau for: Galderma, Allergan, Merz. Rebecca Fitzgerald, MD, FAAD, ASDS has disclosed the following relevant financial relationships: Served as an advisor or consultant for: Allergan, Galderma, Merz. This educational activity may contain discussion of published and/or investigational uses of agents that are not indicated by the FDA. Neither Omnia Education nor TOPEC recommend the use of any agent outside of the labeled indications. The opinions expressed in the educational activity are those of the faculty and do not necessarily represent the views of Omnia Education or TOPEC. Please refer to the official prescribing information for each product for discussion of approved indications, contraindications, and warnings.